This is the Happy Kava Brand Valerian Tincture Blend. Happy Kava Brand has expertly formulated a line of Kava Tinctures that take the best of organic or wildcrafted herbs. There are a number of herbs that have made it into the mainstream. Even those not super familiar with different herbal products have now probably at least heard of the 12 herbs we have chosen to blend with our Noble Kava Root with the Happy Kavalactone lineup. Kava already relaxes. But what if you want to kick your Kava up a notch, and make it the perfect and natural way to get to sleep and stay asleep? This is where Valerian Root comes in. Many herbal blends combine only a few milligrams of each herbal ingredient in their formulations, making it nearly impossible to feel the effects of any of them. Herbs need to be concentrated, and that is exactly what Happy Kava Brand has accomplished with this Valerian Kava Tincture Blend. We add the equivalent of one teaspoon of ground Valerian root powder into every serving of this tincture (4 dropperfuls is a single dose). We don’t add any other filler herbs that help with sleep. All we have in this award winning Valerian Kava Tincture Blend tincture is pure Noble Kava root with a 2-4-6 or 4-2-6 Kavalactone lineup, and pure Valerian root extract. Find out how powerful Kava can be for helping you fall asleep faster when it’s combined with a clinically-proven herbal sleep aid. The Kava relaxes you and eases you into a state of well being that can be conducive to sleep, while the Valerian root works it magic by gently sedating the central nervous system to make it a snap to get some restful, peaceful sleep. Directions: 4 dropperfuls 30 minutes before bedtime. Do not exceed 8 dropperfuls per serving. Daily dosage not to exceed 8 dropperfuls. Maximum period of daily use: 3 months. Use may resume for 3 months after a 2-week break. Caution: If using prescription medications, seek the advice of a health care professional before using this product. Not to be taken during pregnancy or if breastfeeding. Not for use by persons under the age of 18 years of age. Avoid alcohol when using as alcohol can intensify this products effects. Used in excess or with substances that induce drowsiness, the ability to operate heavy equipment or a vehicle may be impaired. The FDA advises that although it appears to be very rare, a potential risk of liver injury may be associated with kava-containing dietary supplements. *These statements have not been evaluated by the Food and Drug Administration. 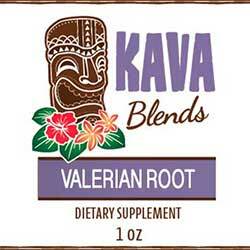 This Happy Kava Brand Valerian Kava Tincture Blend is not intended to cure, treat, diagnose, or prevent any disease.